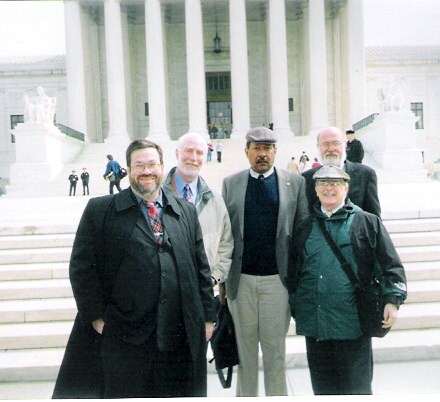 L to R: Clayton Cramer, Alan Korwin, Bob Cottrol, myself (w/ beard in rear) and Joe Olson. And yes, we were feeling good! Where do nattily dressed 2nd Amendment types like that go drinking while in the District? I generally hang at the Old Ebbitt Corner Bar because it is 1) near my usual hotel, and 2) a library paneled tribute to the good life decorated with double barrel shotguns, wooden waterfowl decoys, and real oil paintings of real guys shooting ducks, drinking good booze, and playing poker. Is there a better place? here are some photos I took while in line. Thats a Fine looking assortment of exceptional Patriot-type gentalmen. I hope the "Suprmes" had gotten a chance to see your secondamanedment documentary video. Thank you, David, for posting that great photo. I must say thanks to the Federal Farmer for posting his, as well. How exciting! .416 Rigby asked where to eat in the District. Better question here would be, "Where to you eat when you're just leaving the Supreme Court?" Good answer would be Bullfeathers of Capitol Hill. It's about two blocks from the Supreme Court. Address is 410 First St., SE. RKBA-folks will be in friendly territory: The NRA has offices upstairs. Old Ebbit is a good hike from the Supreme Court; it's at 675 15th, NW. Strike me as being a raffish, unsavory lot. They fit the profile. Call security. mark-1, are you nuts? I would fit right in with that crowd......oh, I see your point. Well, I would fit, except for the neat clothes, intelligence, wit, and natural elan. Other than that, perfect match. There's no better feeling than a victory well-earned after a lot of hard work. Enjoy for now, but ready yourselves for the next battle. I was there that day, took the day off from work, just wanted to be there. Introduced myself to Clayton; knew him from his picture. Sorry I missed shaking hands with the rest of the Usual Suspects. Federal Farmer your pix are very cool! I watched from the sidewalk as the line filed inside and your pix show what it was like in the line. I'm WAY too old to sleep on the sidewalk, but God knows I wanted to! Good show!